Finally we are back on schedule after all the holiday excitement! I'm so excited to start the year with a Celery science experiment. It clearly demonstrates how water moves through in plants. I got the idea from the book Thanksgiving Fun Activity Book . The Book explains the origin of Thanksgiving festival and suggests various activities for the holiday. Fill a cup of water in the bottle and add food color. Adults can carefully cut the stalks of celery. Handover the stalks to kids and let them place the stalks of celery in the colored water. All set! Now start noting the changes! We checked at intervals of two hours! wow Esther.. interesting.. I will definitely try this with Adi.. thanks for sharing this experiment details..
oooh, I love this! We have done something very similar with flowers! @ Ani: do try it! I think Adi will love it! @ Emma: Thank you! Oh how did I miss the flower spark! I love your site and all the science sparks you create for the kids! Very nice idea, Esther. I will definitely try this with my boys. To see things practically takes kids' understanding to a whole new level. This is very good one. we did it with flowers but you are not able to see the interior! I forgot about this experiment...my 5 year old would love it! Thats truly interesting.. and inspiring..
Esther.. Wishing you and all at home.. a happy new year!! So funny- we just did this one last week. Maybe we are sharing brainwaves. I love your photos and description. Beautiful. What fun! We need to do this experiment in our house! I've been meaning to do this experiment for months. I love how you cut the celery up after it was done soaking up the dye. Great idea! Great pictures! It's neat to see what it looks like on the inside as well... I'm going to have to try this with my kids. My twin nephews would love this - time to be a cool aunt again! 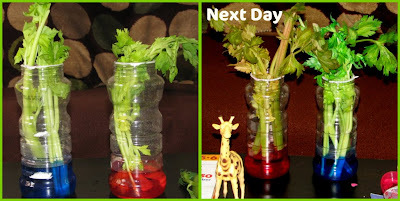 awesome - we did with carnations but love the celery a great way to show how it works the same with other things. I teach 3rd grade and our next science unit is about plants and plant growth. This will be a great experiment to introduce the kids to how roots and stems work! Thanks. I am A student doing some very important experiments for class and this website has helped me a lot.